Most people with a microscope will, sooner or later, want to get images into their computer. Applications include archiving, emailing or incorporating the images into documents or presentations. At right, Nikon CoolPix 990 with camera adapter connected to trinocular port. 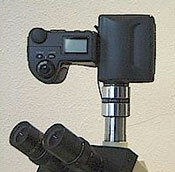 In order to attach a microscope digital camera or a video camera to your microscope, you will need a "C-Mount" adapter. This is an adapter that is microscope specific. For example, if you have a National Optical microscope, you will need the corresponding National Optical C-Mount adapter. 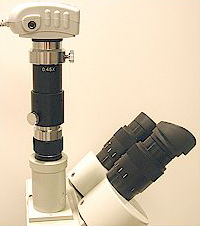 The C-Mount adapter drops into the trinocular port on your microscope and has threads on the end that sticks up out of the microscope. These threads are known as "C" threads and will mate with the C threads on the microscope digital camera. C-Mount adapters have lenses built into them, the most common C-Mount will have a demagnifying lens built into it (usually a 0.45x or a 0.6x demagnifying lens). This allows you to see the equivalent of what you see through 10x eyepieces when you are viewing the camera images. 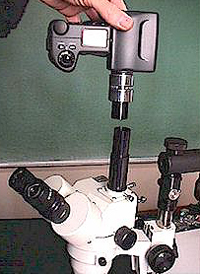 At right the SwiftCam2 microscope digital camera is attached to a Meiji microscope with the corresponding Meiji C-Mount adapter. If you are interested in taking more professional high megapixel pictures and you have a Digital SLR camera or another digital camera then you should consider our camera adapters. These are finely machined parts with internal lenses to offer the best image possible with your digital camera. When using one of these, you either insert it into your trinocular port (ID of 23mm) or remove an eyepiece lens and insert the adapter into the open tube. They are all designed to fit either a 23mm or 30mm (inside diameter) opening in your microscope. Also shown at right is the National Optical part 600-420T (long black adapter tube) used exclusively with the National model 420T. This adapter tube corrects for the proper focal length on model 420, allowing the camera to be in focus at the same time that the eyepieces are in focus.